Hello there, you individual you. 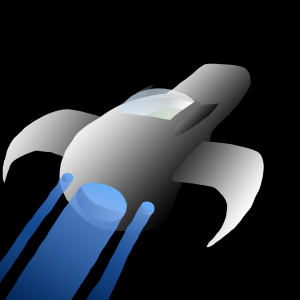 I got started on drawing my spaceship today. It’s far from finished, but the basic design is there, and it’s looking pretty epic. So far, at least. However, it does kind of look like something Darkwing Duck would fly into outer space though, right? Just me? I see a duck face. That will likely change as I work on it. Or… maybe not. I’m not going to spend the rest of this post complaining about my shoddy internet service, but I do have to say that it has really become quite the distraction. I want to say more in this post today, but I want to get this posted because I have lots to do today, and my internet could go out at any moment. It was off all morning and just came on in the past 20 minutes. Blah! So, I’ll just post this as is. I think the ship is looking pretty sweet so far, and I can’t wait to zoom right in and start adding details.